-- Humans and dogs have shared a close relationship for thousands of years. Today, there are around 600 million domestic dogs living throughout the world. Many of them are trained to perform important tasks. 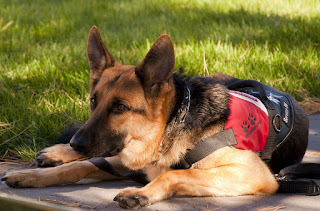 These working dogs pull sleds, assist the disabled, protect us from harm, and search for lost people. They work alongside farmers, soldiers, and hunters. Readers will discover how working dogs are bred and trained and how these hardworking canines find happy homes when it comes time to retire. • Working Dog on Duty sign -- Post notice your dog is working, not lost or abandoned, and should not be bothered. • Where to Go? – Smart Phone App - When traveling with your dog, airport animal relief areas can be difficult to locate but the Where To Go App overcomes that challenge for working dogs, assistance dogs and service dogs in public places.